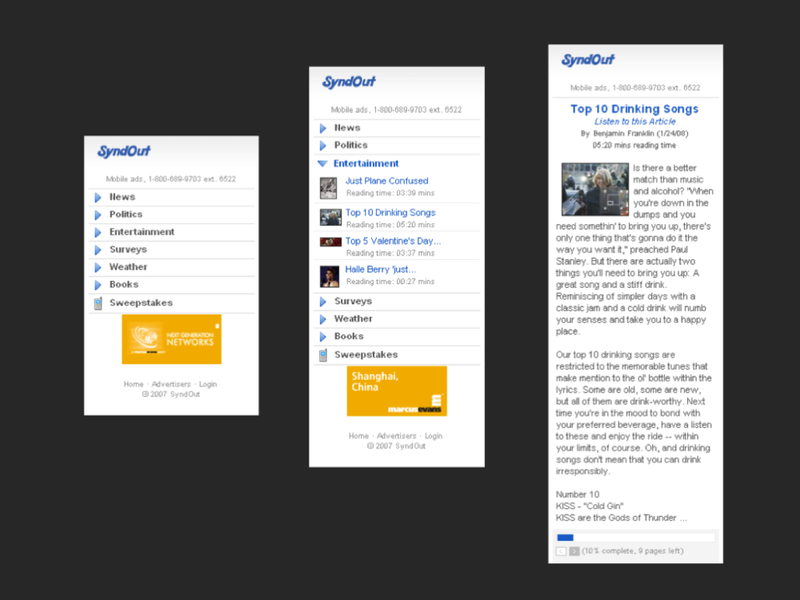 SyndOut was invented in 2004 as a powerful cross-platform publishing and content delivery system for mobile internet devices. SyndOut made the experience of publishing, viewing, and moving content across a variety of platforms near frictionless. In daily life, SyndOut gave consumers the ability to carry with them the information they cared about most. The above template was generated by SyndOut featuring multiple ad formats, a Sweepstakes engine, content listing, and interactive article detail screen with listen option and progressive pagination. As they shifted from moment to moment, place to place, person to person, and screen to screen, so did their content. As a result, the same piece of content could be packaged for “send out” or “syndication out” to any of the internet connected devices encountered in our daily lives. The article detail screen powered by SyndOut featured an "actions" widget with article stats, inline dictionary, print-to-email, shareable mp3, commenting, add to calendar and more. Texas Medical News was a news portal on SyndOut that was designed to run on feature phones. It featured text ads, smart pagination, and a print-to-email feature that would send a PDF or Flashpaper version to your inbox. When a story was "printed" from a feature phone, the advertising engine in SyndOut dynamically inserts text ads into the generated PDF, Flashpaper and the email template body. SyndOut was the culmination of over 12 years of researching and developing corporate websites and portals for leading companies around the world. It was engineered to offer site developers all the tools they needed to create complex mobile sites and allow non-technical staff to contribute content using only a mobile web browser.